Berlin…What can I start with? There are so many things to say about my wonderful stay in this beautiful city…Let’s begin at the beginning! Seen from above, Berlin looked like all other cities: huge, dirty, crowded, lots of streets, traffic jams, buildings everywhere, and so on and so forth. When I landed at Tempelhof Airport (which is currently closed) and when I discovered this city, I had to change my mind. Berlin is unique. First of all, it is huge (some say 9 times inner Paris!). It will take you 40 minutes (at least!) to go from east- to west-Berlin on the U-Bahn or S-Bahn. Despite its hugeness, I never felt oppressed or ill at ease: there are a lot of trees and green spaces. Then, Berlin is multi-faceted. If you stop at Potsdamer Platz, you see huge buildings (like the Sony Center…absolutely crazy! ), lots of cars and people everywhere. If you go one station further, you arrive at the Brandenburger Tor, THE place to see in Berlin (you can see it on the German euro coins). 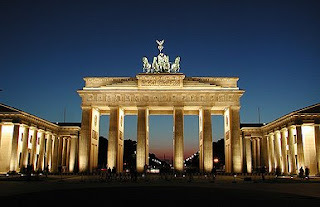 You can also see the Hotel Adlon, which is the most expensive hotel in Berlin! It welcomed Michael Jackson a few years ago. He decided to show his baby to the crowd by hanging it from the balcony…remember? The Reichstag is also worth a walk! Take the S-Bahn one station further and you can discover the Oranienburgerstraβe, the tourist place “par excellence” with a massive amount of pubs, restaurants and discos. It is crowded night and day and you always find places to go out and have a lot of fun! If you decide to go to the eastern side of the city, you will be amazed by all the graffiti and other examples of urban vandalism. If you go to the western side of Berlin, you will find trees, fountains, parks and green spaces. 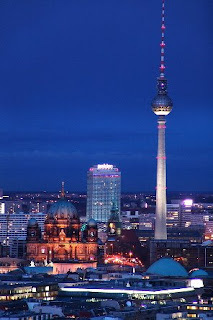 What is more, Berliners are really nice people. They never hesitate to help you if you are lost (which happened to me many times!) and it is easy to make friends! Serious things began in mid-October: I had to go to university. Going there is quite something (45 minutes away from my place), finding your way inside it is something else! The Freie Universität is so huge! Fortunately, I have always met friendly students who have helped me to find the place I had to go! The lectures are also really different from the Belgian ones. In Belgium, you take notes and you study them to pass your exam. In Germany, you research one theme and then you discuss it during the lectures! There are no exams, but end-term papers, for which you have to do a lot of research into a particular subject. Different, but interesting! I also had the opportunity to take part in the activities of the “kleines Simfonieorchester” which is an orchestra for university students. Not only did I play wonderful music thanks to the maestro (Manfred Fabricius, someone simply amazing!) but I also met a lot of German students with whom I spoke German and learned a lot! Native speakers are the best teachers! German food is also something I had to get used to. There are hundred sorts of bread, beers, fruit juice, muesli and sausages! As far as I’m concerned, I enjoyed it and warmly recommend it… as it is full of fat and calories and you need them to brave the bad weather! Rain, wind, clouds, snow, cold… Not Madrid at all! Plus qu'à aller visiter cette ville à présent. Tu me sers de guide ?